We packed up the road gear and hit the bricks sometime after work Friday. The weekend was going to be huge and we wanted to be sure we would do it right. After a pit stop in Topeka, we tooled into Manhattan. A friend of ours was nice enough to invite us into his sister’s house for the weekend and welcome was gracious. We met them at the Little Apple Brewery and chomped down on some tasty steak and German Potato Salad. It’s the best potato salad out there. We followed them to the house and then geared up for Aggieville. 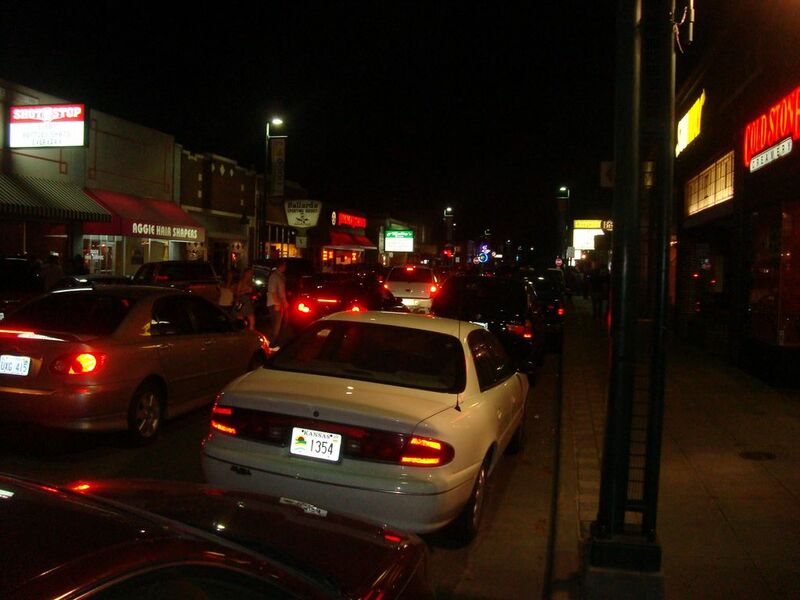 For those of you who don’t know Aggieville, it’s the place to be in Manhattan. 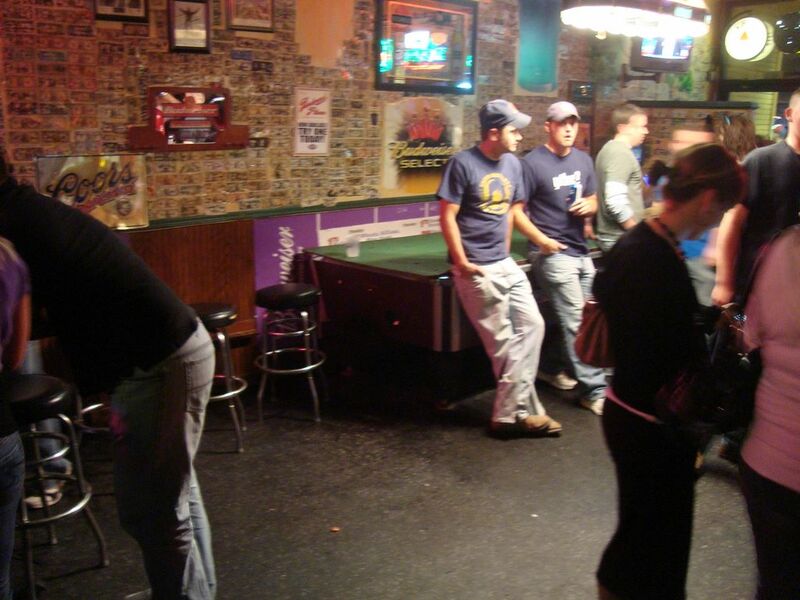 A hop, skip, and a jump away from campus, Aggieville is the main hub of entertainment and night life for Manhattan. We haven’t been in years so it was nice to see what has changed and what stayed. 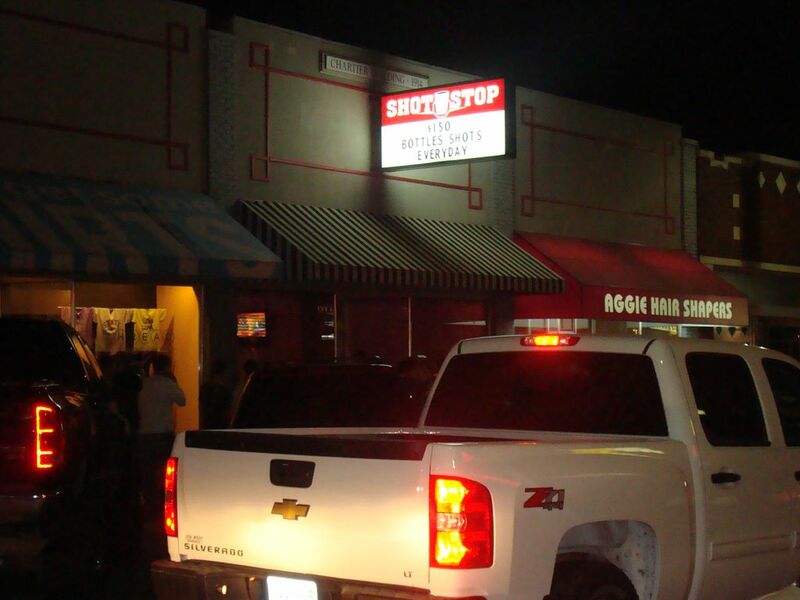 The biggest new shop set up was a place called Shot Stop. Basically you walk in a order a shot off a chalk board menu much like that at a coffee shop. You get a view of all the ingredients and the prices right up front. Very nice indeed. But we came down there for the our bars. The path we took thorugh Aggieville ended up being much like the same one we had when we were at school there. After Shot Stop, we headed to O’Malley’s. The old irish bar did us well as we had a Belfast Bomber and made way to Auntie Mae’s. The Tarantulas there are tasty and next time we’ll re-live a Parrot Shocker next time. After a quick stop at Fatz to eyeball some fishbowls and a cut through Rusty’s, we found ourselves in the bigger version of O’Malley’s. Now the pool table that used to be there is gone but at least the Guiness never left. Thanks, Aggieville, for the great times. Saturday morning we groggily got up and matted down our hair to get ready for the Sunflower Showdown. We ate breakfast at the house so we didn’t get a chance to cook up some early morning tastings for tailgate. But we did find a couple of cans of JOOSE to get us going. Seriously, you must have this drink if you’re in the market for an alcoholic energy drink. It’s all we had for the day. We parked in the Vet Med building and made our way to the tent. The tent action was decent as the energy from the fans kept things from getting too dull. 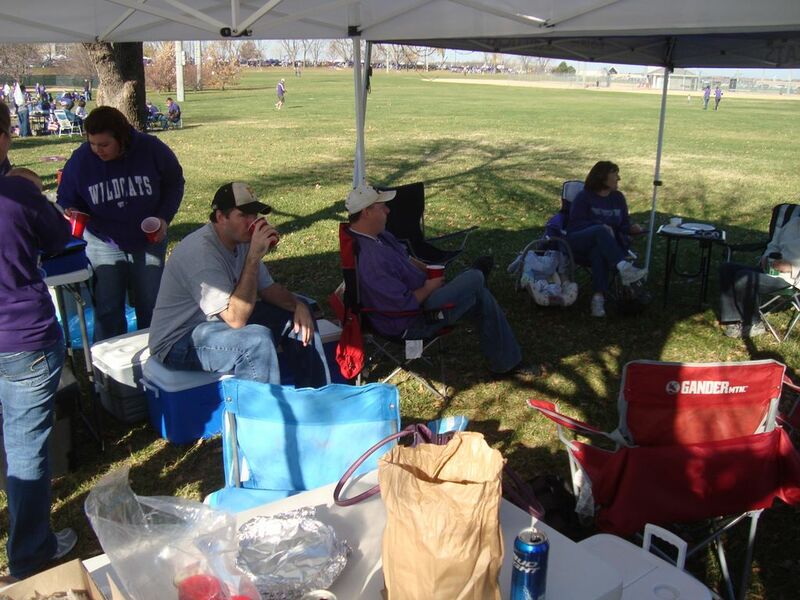 We spied some Franzia and hung out with some other tailgaters. They had some tasty chips and bratwursts, but by then the JOOSE was keeping us loose and food was no option. Even though we forgot to bring a football, someone else did and we tossed it around a bit. Old friends showed up, we toasted ourselves a wee bit more, and we loaded up to make our way to the stadium. Kansas State coming into this game showed some promise as they kept it competitive last weekend against Oklahoma. Kansas was on the other end as Todd Reesing and company were trying to find the identity they lost last week against Texas Tech. The story coming into the game laid out the ground work for the story of the game. Todd Reesing tossed a couple of interceptions early and Daniel Thomas drug Kansas State on his back for a low scoring win. Kansas State 17, Kansas 10. Kansas has a chance to get some respect back for the end of the season and Kansas State has a shot at the Big 12 North title if they beat Nebraska. Don’t hang your head too low, Kansas fans, Mark Mangino never won in Manhattan. Congrats to the Cats and no matter how the season turns out, they exceeded expectations and clinched at the very least Coach of the Year for Bill Snyder 2.0. We left the game and celebrated hard for awhile in the parking lot. 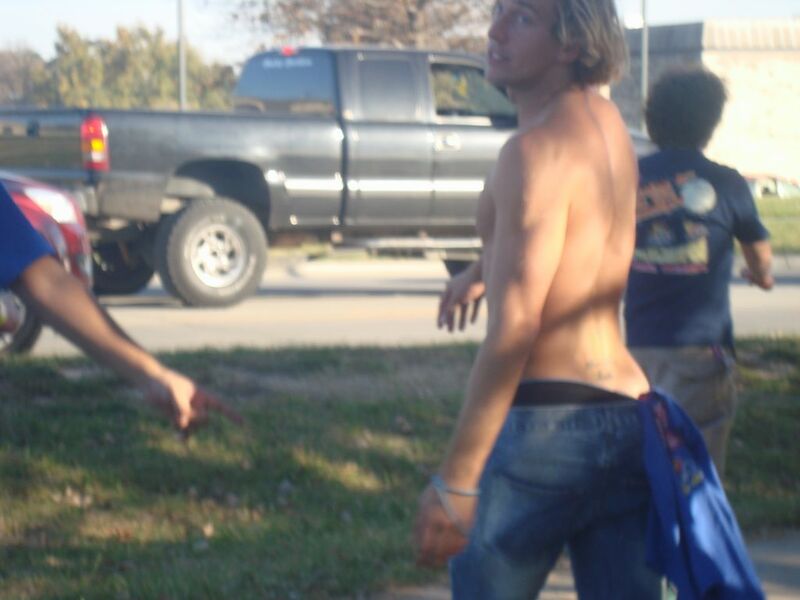 We talked about how Colt McCoy and Texas never beat Kansas State and we laughed at the Kansas guy with a tramp stamp. After the traffic died down, we saw some old friends and headed back to the house. Another steak dinner later and we finally caught up to the rest of the day’s events. Sorry, Big 10, maybe once you find out how to be winners, we can respect you again. Sorry to you too, Pac 10, you’ve been exposed as well. This year, the Big East is dancing with the big boys. Cincinnati has the inside track with a couple of mid-cons to sneak into a national title race if the SEC or Big 12 stumble. We stumbled our way out to the car and the prettiest DD this side of the Mississippi carted most of us back home to Kansas City, jamming out to Bon Jovi the whole time. We conquered Manhattan and washed ourselves in its miracle waters. Little did we know that it would be poured down on us in the form of JOOSE and a Sunflower Showdown victory for Kansas State. We forgot what college outside of the books was all about. 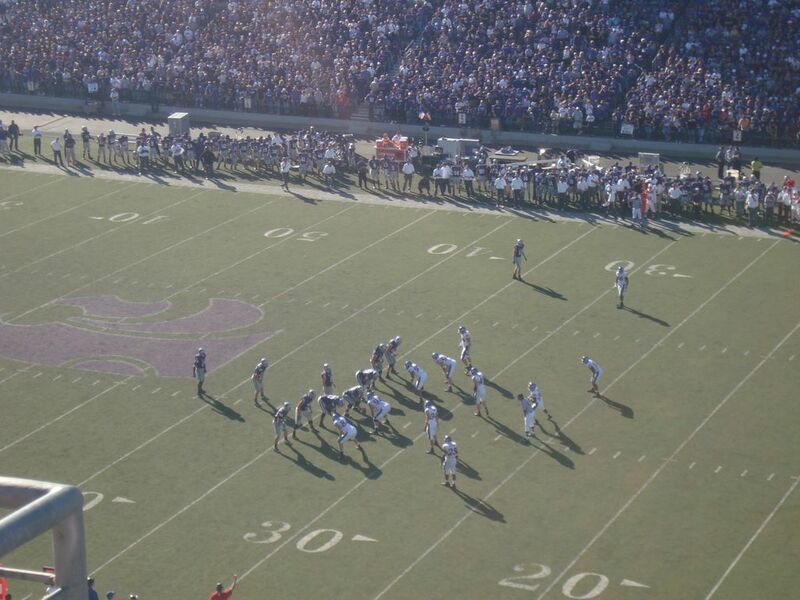 Thank you, Manhattan and Kansas State, for reminding us why we miss you so.